Share "Giving Cats a Good Indoor Life"
Pet owners who keep their cats indoors not only protect their local wildlife, but also protect their favorite feline. Even if a cat is used to being outdoors, it is still easy to give them a fantastic life indoors. Because of all these threats, it is no surprise that cats kept exclusively indoors live much longer, healthier lives than their outdoor counterparts. In fact, an indoor cat may live 5-10 times as long as an outdoor cat, giving many more years of faithful companionship to its considerate and responsible owner. A happy life begins with a healthy life. Be sure your cat gets appropriate veterinary care, including vaccinations, dental care and regular checkups. A nutritious diet, regular grooming and suitable exercise will all help keep your cat happy. Cats enjoy new, novel toys, especially interactive items they can bat around or get responses from with noise, lights or motion. Toys do not have to be expensive, but they should be rotated regularly to keep each play activity fresh and interesting. The best toy you can give your cat is yourself, and they will love the time you play with them. Drag a string for them to "hunt" or toss a ball of aluminum foil for them to chase. A paper bag can also be a fun toy, especially if your hands or fingers make it move. 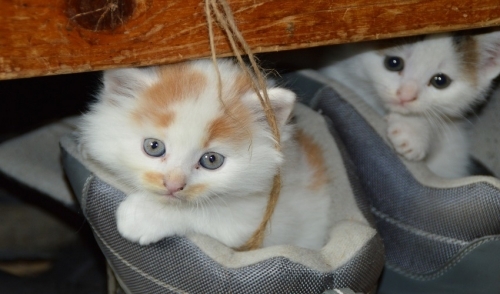 Climbing and exploring are irresistible to cats, and you can get vertical with a kitty tower or similar structure for them to climb. The best towers for the happiest cats will have multiple levels that include tunnels, hidey holes, scratching posts and napping platforms. Provide your cat a view from a wide ledge, seat or platform by a sunny window. If a bird feeder or bird bath is noticeable, your cat may stay vigilantly watching it for hours, and if you open the window slightly (with a sturdy screen in place!) the fresh breezes will be invigorating. Many cats will nibble on grasses, and you can get an indoor kit to grow safe, attractive cat grass from a pet supply store. Keep your cat away from other houseplants, however, which can often be toxic. For a special treat, consider growing some catnip now and then. If you want to go high tech for a happy cat, consider cat-friendly television. DVDs and videos are available that include a range of nature sounds and images of birds, mice or other wildlife that will catch cats' attention. Running a video can help keep cats entertained for hours. While some cats prefer to be solitary, many cats do enjoy having a friend. While you can be that friend, if your work or social life keeps you away from home frequently, consider getting a second cat or even a dog to keep your cat company. If you still want to give your cat some outdoor time but want to keep them safe, try constructing a cat patio – a catio. This can be as simple as a pet run with a roof so the cat cannot roam freely, or it can be a complex maze of paths and ledges that go between different windows of your home. A screened-in gazebo is another option that can easily be equipped to keep your cat safe.